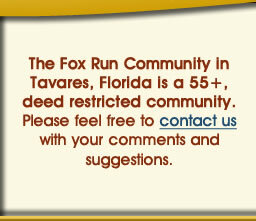 Fox Run is located within the city limits of Tavares, the County Seat of Lake County, Florida. Approximately 35 miles Northwest of Orlando in Central Florida, Tavares is about 60 miles from either coast, and only 10 miles from the Florida Turnpike. We are about an hour's drive to the world famous attractions and the Orlando International Airport. Our professionally planned community offers a rare combination of a tranquil country setting with all the conveniences of city living. Fox Run is comprised of 341 Manufactured homes on lots that are owned by the residents. Our common areas include a clubhouse, two pools, one of which is heated, shuffleboard courts, scenic ponds, and a long scenic boardwalk along our beautiful canal. Fox Run has a marina with spaces for approximately 55 boats, and canal providing access to the Harris Chain of Lakes. Homes along our canal have access to their own docks. An excellent network of cypress-lined canals, rivers, and lakes stretch for hundreds of miles, all the way to the Atlantic! The city of Tavares provides water and sewer services, paved, lighted streets, police and fire protection. In August of 2003, Florida Waterman Hospital opened its new 204 bed acute-care facility just 15 minutes from Fox Run. The 450,000 square foot facility offers the latest in medical technology. Our community is noted for its high level of activities, volunteerism, and clubs. We have a Social Committee, Boat Club, Golf, five breakfasts a year for the community, Cards, Bingo, Crafts, Line Dancing, Water aerobics, Chorus, Shuffleboard and more. Easy access to boating, fishing, shopping, educational and cultural activities, public golf courses, and beaches are added conveniences for enjoyable retirement living.